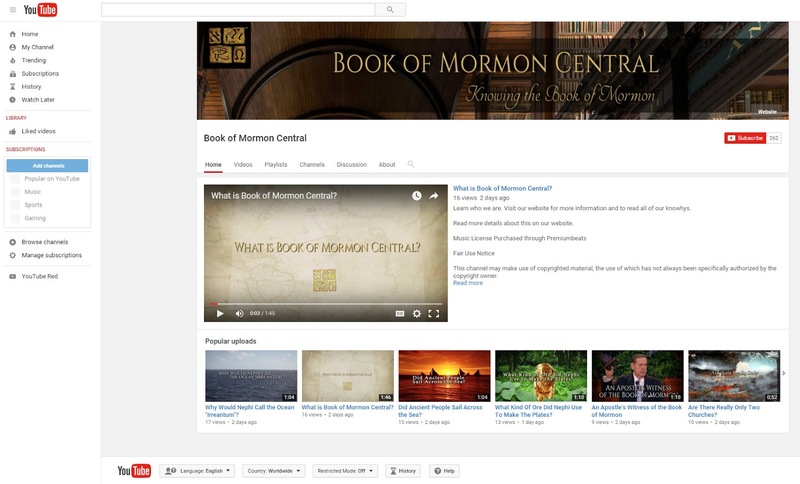 Book of Mormon Central has now been publishing KnoWhys five times a week for a month. Each KnoWhy is a brief, illustrated, foot-noted essay about some interesting facet of the Book of Mormon and its significance. Each KnoWhy gets co-published simultaneously on bookofmormoncentral.org and Meridian Magazine. The essays are sent out as PDF attachments to an opt-in list of email subscribers. A short KnoWhy video gets posted on Facebook, Google+, and YouTube. Content appropriate to each venue gets posted on Twitter, Instagram, Pinterest, and Tumblr. An unpaid management team (Jack Welch, Kirk Magleby, Taylor Halverson) directs the synthesized efforts of full-time staff (Neal Rappleye, Stephen Smoot, Jasmin Gimenez, Zander Sturgill, Matt Cutler, Jared Riddick, Nicole Shepherd, David Larsen, and Alejandro Martinez) and part-time freelancers (Amanda Cook, Scott Christopher, Nick Galieti, Robert Starling, Tayler Nelson, and Jody Livingston). Terrific volunteers help with research, writing, editing, reviewing, art, music, photography, graphic design, etc. Volunteers include Alan Miner (Utah), Garth Norman (Utah), David Osborn (Monaco), Scott Hoyt (Texas), James Stutz (Texas), Jonathan (J Max) Wilson (Utah), Quinten Barney (Utah), Mickey Cochran (Utah), Jerry Grover (Utah), Walker Wright (Texas), Jerel Lindley (Utah), Joe V. Andersen (Arizona), Ugo Perego (Italy), Lee Donaldson (Utah), Jacob Rennaker (California), LeGrand Baker (Utah), Amanda Brown (Israel), Don Norton (Utah), Tim Barker (California), Russell Stevenson (Utah), Mike Peterson (Utah), Art Brothers (Utah), Paul Brooks (England), and Blake Dalton (Utah). Book of Mormon Central needs many more good volunteers who want to help share this marvelous work and wonder with the world. If interested, go to Book of Mormon Central Contact and message the Exec. Director. YouTube is a special case. We posted our first video just after midnight on Friday, January 1, 2016. Within minutes, YouTube took our video down and shortly thereafter our entire channel went dark. Our social media publisher got an email saying we were in violation of community guidelines - i.e. people were complaining to YouTube that we were spamming them. The allegations were groundless so we began the lengthy process of written appeals to Google. After weeks of being in limbo, Jack Welch's brother, James, who is Bishop of the Stanford YSA Ward, ran into a ward member who works for YouTube. Our channel was quickly restored. There are currently 22 KnoWhy videos posted along with an intro piece. If we can hang onto our channel, we intend to continue posting KnoWhy videos on YouTube for years. Over time, this will become a significant resource for students of the text. YouTube's system of crowd-sourced policing is effective. It puts the burden of proof on content publishers to remain compliant with community standards. The down side is that organized haters can take down a YouTube channel through a coordinated campaign of unfounded complaints. A side note: James B. Welch is a professional organist affiliated with the University of Santa Clara. I last heard him in the Tabernacle on Temple Square. He opened the 2015 summer organ recital series at the Cathedral of Notre Dame in Paris.